and the Maximum Philharmonic Orchestra. Special guest Jan Hellriegel. Following the launch of his critically-acclaimed album, “The Lights of Te Atatu,” Dominic Blaazer is pleased to bring his Maximum Philharmonic Orchestra to the PumpHouse Theatre. The 7-piece orchestral band recently performed at Neil Finn’s Roundhead Studios, following two sell-out performances at the 2017 Auckland Fringe. 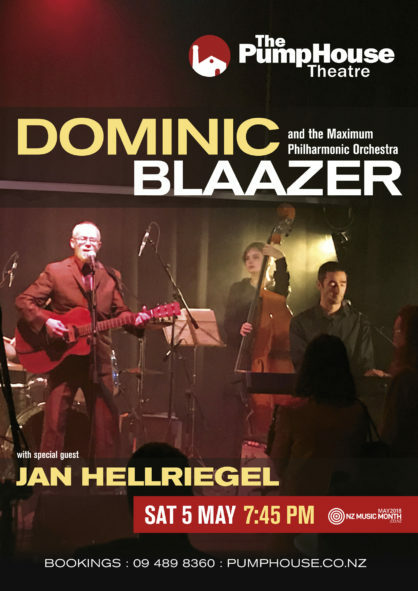 Our very special opening act is Jan Hellriegel, one of New Zealand’s most respected songwriters. For this evening Jan will be using the piano to showcase new songs from her forthcoming album as well as re-imagining some of her hits of yore.